The first time I stood in Metelkova on a Friday night I thought that here, if anywhere, is an autonomous zone. There were four different bands playing in the surrounding clubs and hundreds of people were drinking, smoking, and generally having fun. Metelkova is not meant to appeal to the mainstream. It is a place free of the influences of the state and hegemonic culture; yet when you look, you see more than just a giant party. It is an institutionalized setting. Without the institutionalized setting it would have died out years ago. The idea of a TAZ (temporary autonomous zone) is explored in an article written by Hakim Bey. He describes zones of “space, time, or imagination” that can be liberated to create a free culture. They disappear as soon as they are named or identified, only to spring up somewhere else. It is cultural resistance without engaging the state, and it continues only as long as possible suppressors don't know it exists or have no way of understanding the form of resistance. Metelkova cannot be said to be part of this framework. It is named, it is defined, and it is an institution that has experienced attack after attack from the mainstream media and from the municipality of Ljubljana. It is not a specter that the state fails to see. The situation that created the space, the original squatting, was a manifestation of this TAZ phenomenon. The place was squatted and it was liberated, but the intention was to make something permanent. It is a sizable plot of valuable land technically owned by the city. This kind of uninstitutionalized space could not continue on a permanent basis, especially in the face of the concerted attempts by the media to portray the place as a haven for junkies and drug dealers. The stated purpose of Metelkova is to create space for alternative culture and art, but at the same time it also protects the space liberated by the TAZ uprising from threats to destroy it. In this way, the institution that is Metelkova today is the footprint of a TAZ. But that isn't all that there is to say about Metelkova and the concept of TAZ. While Metelkova itself is permanent and constantly needs to directly resist the state through negotiation, there is still an element of the TAZ in its appeal. One of the original squatters who worked as Metelkova's PR agent in the early years, Miha Zadnikar, reminised about a time that Manu Chao, the famous musical artist, came to Ljubljana. According to Miha, Manu Choa's manager refused to set up and play in Metelkova, preferring one of the more mainstream venues. Later that night, Manu Chao showed up at Metelkova with his guitar and played in front of the open kitchen for himself and two hundred others. It was not planned by Metelkova's organizers. It simply happened. Something similar happens every Friday night when several hundred people gather almost by coincidence in Metelkova. Bands play in the venues on the edges of the complex and the clubs play more mainstream music in order to attract crowds and sell beer. In the middle is a vast crowd of people smoking, drinking, playing music out of their car stereos or strumming on their own guitars, all talking and mixing. The actual physical space is perfect for this. All the buildings face in towards large open spaces; people form crowds outside the clubs and mix. Sometimes a small group will kick a bottle between them or throw a Frisbee around while standing among the crowd, somehow managing to not hit anyone who isn't playing despite the number of people in the area. This is the TAZ. There are between 80 and 100 organized events in Metelkova in any given month, but it is the party that most people come for. I have asked some fifty people “Why do you come here?” and every single one has mentioned the party. But this space isn't simply a place to socialize. Miha said that the city government doesn't understand Metelkova and focuses on the legalization of the institutions and overlooks what is really important. When I asked what that was, he said “many small things” and gave me an example that struck me as odd: “Silence.” During the day, Metelkova can be a tranquil place, which is another function of the spatial freedom. Metelkova is a group of clubs and artist's studios that share a space and try to promote alternative media and culture. But almost more importantly, it defends a space that is culturally liberated and open to all. The TAZ within Metelkova is its spirit. The task of squatting Metelkova in the early 90s was no small feat. It took months of struggling with the City of Ljubljana and the Government Republic of Slovenia before the two declared the former military barracks as space usable by the Network for Metelkova. The original founders of the cultural space utilized their knowledge of Slovenian laws as well as excellent organizational techniques efficiently and successfully. Despite the many changes that have occurred over the past 15 years, many participants believe Metelkova has retained the original punk mentality in its operations, valuing aesthetics and politics that challenge mainstream conventions. The punk community has historically been associated with squatting and has undoubtedly influenced the plan of action for the space. The Do-It-Yourself ethos pervades its volunteer-run cultural spaces, artist residences, and political activism. Yet other users of the space are unconcerned about this ethos and believe it has declined in recent years. Many of the teenagers who frequent Metelkova on the weekends have said that they do so because of its location, lax alcohol policy and semi-closed quarters; it gets them off the street and gives them a place to be on weekends. Metelkova is a safe haven where they are less likely to get approached and questioned by police officers. Several teenagers have commented that they have met numerous intimate friends there and have virtually no other place to go. Coincidentally, there seems to be a link between coming to Metelkova simply to socialize and a lack of historical knowledge about the space itself. Young adults who are more connected with the punk scene in Slovenia expressed some discontent with how Metelkova has changed within just the past five years. In their opinion, Metelkova is now overrun with 14 and 15-year- olds who attend simply to drink heavily and talk with friends; they remain clueless about the struggles that the Network for Metelkova has had to go through in order to secure the space. 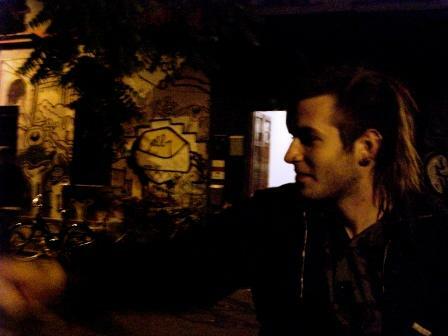 Other self-proclaimed punks lamented the current state of Metelkova due to its alleged severance with punk aesthetics. Older persons involved with Metelkova focus on the positive effects that the center has but were also open about issues that it faces. According to Natasa, an original squatter, there were over 80 events happening at Metelkova each month in the late 1990s, of varying origin. She argues that “music was always the main culture” in the beginning and Metelkova has since then expanded to include “other social groups” who want to utilize the space. She believes this is why more outsiders are now involved and Metelkova is not so empty in the daytime. Original participants grew up in the Tito and post-Tito eras, when Yugoslavia trumpeted its system of worker self-management and mix of socialist, communist, and social democratic economics. Although worker self-management lost energy and was abandoned when Slovenia became independent, the ideas of collective decision-making and shared public resources remain hallmarks of Metelkova’s practice in some areas. The graffiti present in Metelkova is not only a strong aesthetic characteristic, but also ingrained in its cultural background. The purveyors of visual art in the space have utilized the previously bleak and crumbling walls of the former “Fourth of July” military barracks to reflect the communal ideals of artistic expression and appreciation in the space provided. The walls of Metelkova have changed innumerable times over the last 15 years; even though the content may be different, the spirit is still present today. Metelkova has faced continual criticism through the years. Many inhabitants in Ljubljana believe that the street art in Metelkova has influenced lowbrow and amateur artists to add their graffiti to commercial buildings and other non-approved spaces throughout the city. 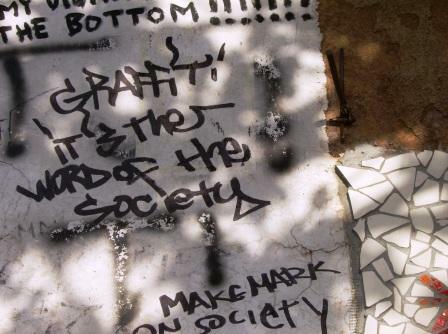 According to Natasa, an original founder, some of Metelkova’s neighbors recently wrote to the mayor of Ljubljana to complain that the cultural center encourages graffiti artists to tag their houses. If Metelkova’s visual art does inspire unprofessional artists to create works in Ljubljana, the issue at hand may be that they feel they are below the level of doing their work in an artistic space like Metelkova. This may inspire them to try minimal pieces throughout the city in order to improve their skills or increase recognition. Anrea, an artist-in-residence from London, believes this is a possible explanation. It may also be plausible that street artists intend to create intricate designs but are deterred by the possibility of facing legal charges if caught. According to a local DIY artist, the consequence for creating graffiti in the city is a fine around 2,000 Euro. Apparently there is an informal code of conduct when creating art within Metelkova as well. Anrea commented that artists have an ‘anything goes’ policy that gives them the freedom to do designs as they wish. Despite this freedom, they are still bound by a common respect for others’ art. He recently painted a beautiful black and white rat on the front of the Metelkova 6 building and noted that he only utilized space that did not have much going on. Each artist at Metelkova uses his or her own personal judgment when choosing both the piece to create and the space to decorate. This freedom of artistic expression and creation is truly enviable and independent artists may be attempting to emulate this sovereignty. For more information about Anrea, please see the interviews section. Also check the photo gallery to see a collection of graffiti images.